Draplin Design Co.: DDC-020 "Long Breed Gary Torso Cover - Lime Green"
DDC-002 "Anvil Strength Torso Cover"
DDC-003 "Factory Floor Issue Yardstick"
DDC-004 "2006 Work Station Calendar"
DDC-020 "Long Breed Gary Torso Cover - Lime Green"
DDC-021 "Long Breed Gary Torso Cover - Virgin White"
DDC-022 "Field Notes Year-At-A-Glance Calendar"
DDC-024 "Adventures In Plastics Heritage Clic Pen"
DDC-025 "Adventures In Plastics Northlock Clic Pen"
Photo: ©2008 DDC Merchandise Archives. This whole thing started a little over a year ago when Jason Sturgill invited me to make a piece of art of the Wurstminster Dog Show. I was floored and flattered and honored, then, started to sweat profusely. See, I get really busy and when I get busy, things get rough. What the hell was I doing accepting this invitation? Where was I gonna find time to make a piece of Gary art? Luckily, I prevailed. By the grace of Gary, I found the time, got the piece done and kinda “handed in on time.” And, along the way, got a couple new tools and implements used in the crafting of my wood piece. A win/win deal, really. The title of my piece was, “The Dachshund: A Really Long Breed.” Gary’s pretty long. In fact, every other dog looks oddly “short” to me now. Ha. That’s kinda funny. Thanks to everyone who wrote in requesting this design as a t-shirt. You better buy one. 01. Really, really thick ink on durable fibers. Raised, even! 02. “Gary Coat” reddish-brown ink. 03. Based on our piece in the amazing Wurstminster Dog Show. 04. Available on a quality “Lime Green” torso cover. 05. Available in sizes: S, M, XL and XXL. 06. 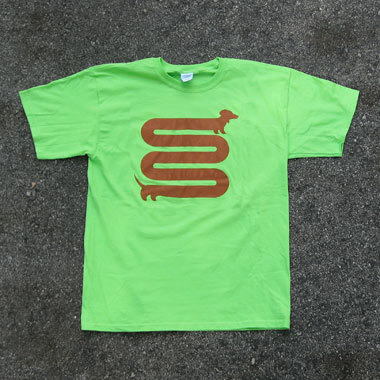 This one is for our dachshund-loving brothers and sisters. 07. All proceeds go to Gary’s well being.